Map of Abandoned Railroad Rights-of-Way. Contact: railtrace91@gmail.com to report errors or additions to the map. Any railroad lines that you provide will be added to the map in due time as well as credited to you! 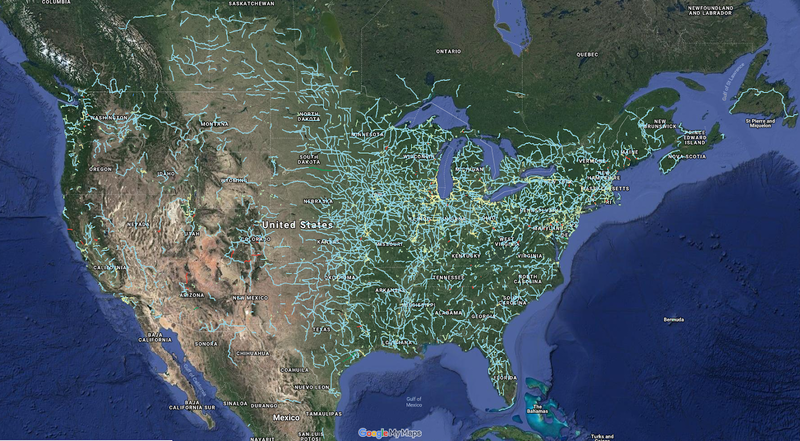 This is a working map primarily of abandoned railroad lines across North America, with layers to include abandonments across the rest of the world, tourist trains and heritage railways, and unbuilt railroads. This map is incomplete, and will almost certainly remain incomplete. 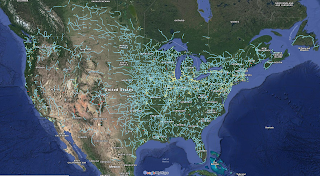 For the purposes of this map; the terms railbanked, out of service, disused, and abandoned are used interchangeably. This map is owned and maintained by Andrew Grigg, and while this is free to use for non-commercial purposes and applications, any data gathered from this map should provide a link to it as well as a citation. I am in no way responsible for any errors or misinterpretations within the map. Unless specifically stated otherwise, I have no affiliation with the authors of any websites, books, or other links which are provided for individual railroad lines. An exception is any link to an eBay page, as an affiliate, this website may earn commission for any purchases made, via the eBay Partner Network. Thank you for doing such a great job in recording these lost rails. Mark, thanks for the kind words. It is an ongoing process to add these corridors, and while I've done plenty myself for finding lines, I also have to thank all of those who have contributed and supported the map as well, as it would be much less full were it not for their contributions! Any way to incorporate some of this information in https://www.openrailwaymap.org/ ? Thanks for the comment. I love OpenRailwayMap, but the UI limitations are the exact reason why I continue updating this map, and have people email me their contributions to add to it. Abandoned rail lines are more than just that, there’s history here as well as appropriate links to more information than I or any other map could provide. Context is key! That said, this map will almost certainly never match the amount of content that ORW has. But at the same time, I would love to find a solution which allows users to upload information, and if another UI has a better system for that while allowing pertinent information to be displayed, I would be very interested in that! R., Thanks for the information. I have added the Winston-Salem line to the map. Hope to be able to take it off someday. Please let me know if there's anything else you know of to add!